Graduate and professional school students and those who have completed graduate studies within the last five years may apply. Areas of study may include social/behavioral sciences, health and medicine, physical or biological sciences, engineering, law/business/public administration, or relevant interdisciplinary fields. Can undergraduates apply for the Program? No. The program is for graduate students, postdoctoral students, and professional school students (e.g, Master's, JD, MD, PhD). Does the Fellowship Program have a citizenship requirement? Am I eligible if I have temporary worker status (H-1B or TN)? No. 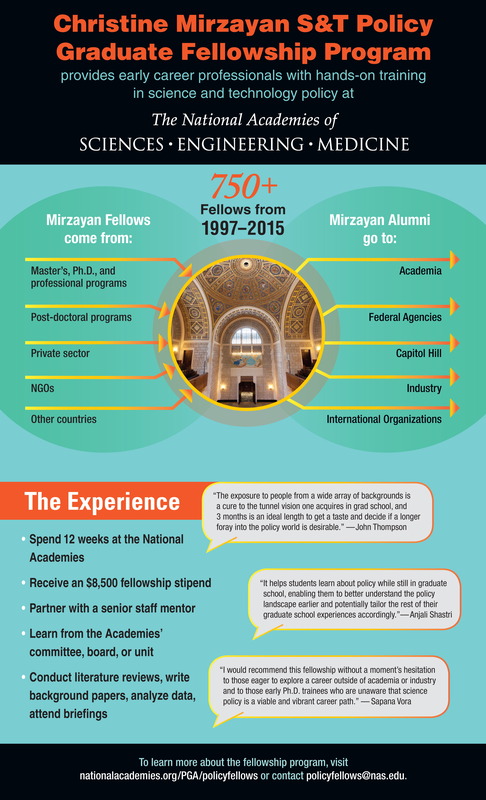 The Mirzayan Fellowship is a fellowship award, not employment by the National Academies. Do I have to live in the United States to be considered? No. Applicants are not required to live in the United States at the time they apply if they are US citizens, US permanent residents, or hold valid status in one of the visas listed above. Do the National Academies sponsor visas for the Fellowship Program? Would a graduating senior who will be entering a graduate program qualify for this Program? No. You must be attending a graduate or professional school or have recently graduated from a graduate or professional school. Can I apply if I'm just past the point of being a postdoctoral fellow? Yes. If you completed your graduate studies (degree awarded) within the last 5 years, you are eligible to apply. Are the social sciences considered as a "science"? Can law and business students in professional programs apply? Yes. Given the importance of science and technology today, students in professional schools undoubtedly benefit from exposure to science and technology policy issues.